Industrial Ethernet ProfiNet cables are designed to provide reliable network communications in the demanding Industrial and Process Control environment where difficult EMC conditions are pervasive. 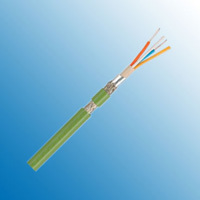 Conforming to the EIA/TIA-568 standard, These cables support half-duplex high speed communications.It ensures superior transmission properties and can be used even under most severe conditions. 0.50 GOhm x km min.